Growing up most of us had a favorite candy bar, something like Reese’s Peanut Butter Cups, Heath, or Almond Joy. Well, keto friends, there’s absolutely no reason we can’t remake those classic favorites into keto-friendly versions that we can eat and enjoy, and even use as a means to get in high-quality fat to keep our macos on-point, fuel ourselves, and stay in ketosis! 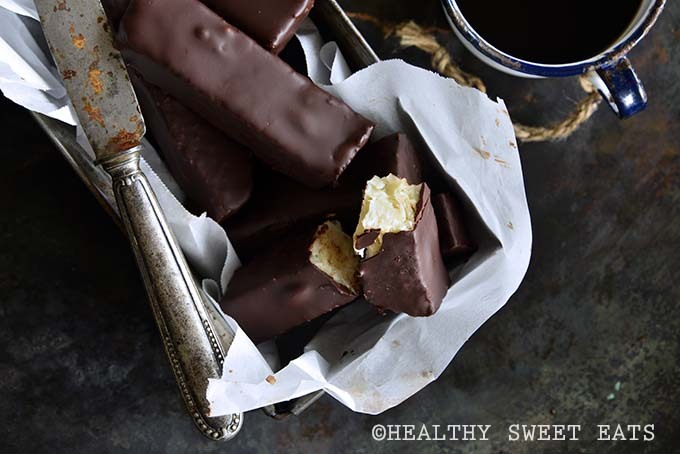 If you liked Almond Joy bars before going keto, you’ll LOVE these Keto Almond Joy Candy Bars. Homemade Keto Almond Joy candy bars are surprisingly quick and easy to make! There’s no baking required in the method I use, and it takes just a little over half an hour from start to finish. My method involves combining a keto version of sweetened condensed milk with coconut flakes in a food processor, and then pressing the mixture into a 9 by 5-inch loaf pan lined with parchment paper. 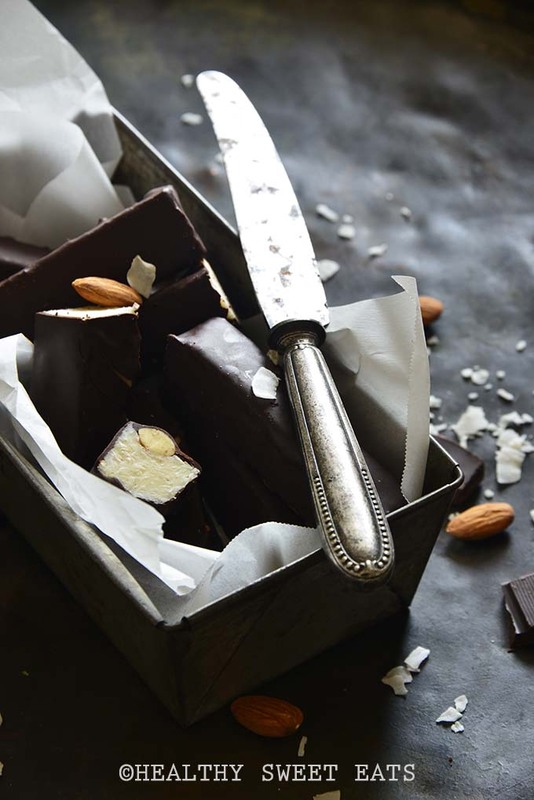 Almonds get pressed into the coconut, and then the candy is chilled and cut into bars. After that the bars are dipped in chocolate, and left to harden. And then you get to enjoy them! The coconut filling is where the magic happens here. When I was thinking of different ways to make this recipe, I wanted an ingredient that would both sweeten and bind the coconut, without the need to be cooked after it’s mixed with the coconut (because the coconut in Almond Joy isn’t toasted and I wanted to keep the flavor integrity of this homemade version as close to the original as possible). Because I wanted the filling to have some chew to it, I used coconut flakes here instead of shredded coconut. Sweetened condensed milk was the obvious choice to both bind and sweeten the coconut filling, but of course I had to make my own version since there isn’t keto sweetened condensed milk on the market. Sweetened condensed milk is very easy to make. First, cream, butter, sweetener (I use a blend of Swerve Confectioners and stevia glycerite for the best flavor), and a touch of salt are cooked down until thick and luscious, and subsequently a bit of vanilla is added in. This method works like a charm and will be my go-to keto sweetened condensed milk recipe from now on. 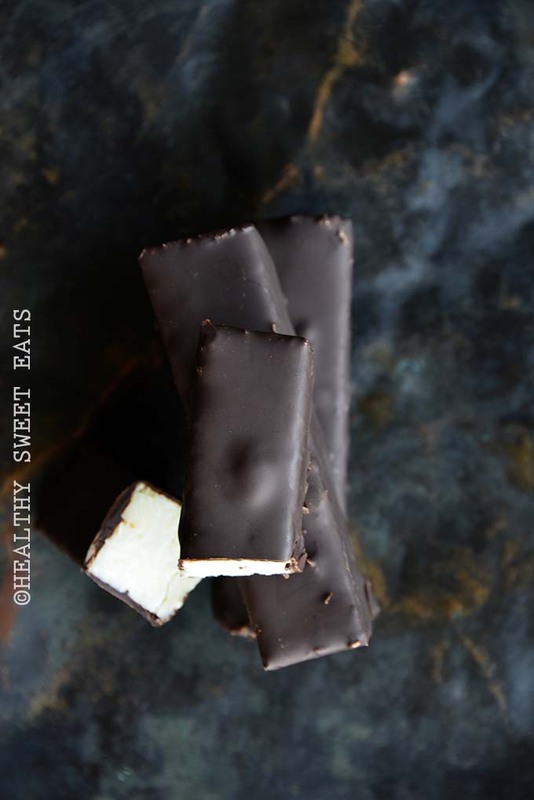 I used 90% dark chocolate to coat these candy bars; however, you could alternatively use stevia-sweetened chocolate. I like to keep it simple and just use a good-quality chocolate and let the flavor of the coconut filling shine through. Like the jingle from back in the day said, “Almond Joy has nuts, Mounds don’t! Because sometimes you feel like a nut, sometimes you don’t!” Additionally, another difference is that Mounds is dark chocolate and Almond Joy is milk. In the keto world, fat bombs are a helpful tool to stay in ketosis. Fat bombs are a low-carb, low-protein, high-fat treat that can be added to a meal plan to help meet your macros and make sure you’re getting in enough fat to stay in ketosis and properly fuel your body. (Read more about fat bombs on Ruled Me.) 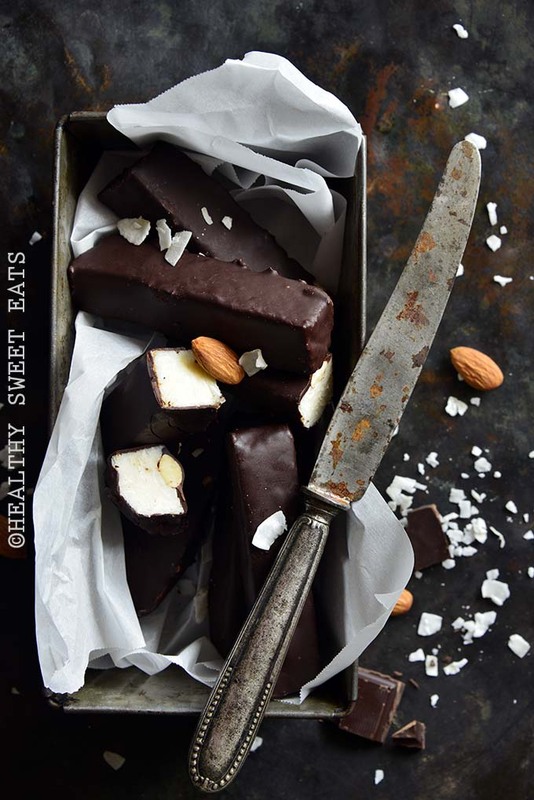 These Homemade Keto Almond Joy Candy Bars are a great way to help you get in healthy fats! 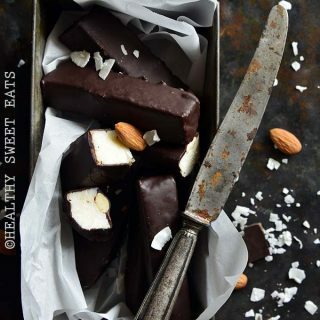 These Keto Homemade Almond Joy Candy Bars are sure to satisfy your deepest cravings for a chocolate bar while staying in ketosis! Add the cream, butter, Swerve Confectioners, stevia glycerite, and salt to a medium saucepan over medium heat. Bring to a boil and then turn the heat down and simmer until thickened, about 10 to 12 minutes whisking occasionally. Stir in the vanilla. Add the coconut flakes to the bowl of a food processor. With the motor running, drizzle the cream mixture into the coconut. Process until it comes together like a chunky dough. Line a 9 by 5-inch loaf pan with parchment paper and press the coconut mixture into the bottom of the pan, evening it out with a metal spatula. Evenly space out the almonds so that there will be 2 almonds per bar when you cut it cross-wise into 8 equal pieces, lightly pressing them into the top of the coconut. Transfer to the fridge to chill, about 1 hour. Cut the candy cross-wise into 8 bars. Melt the chocolate in a double boiler or microwave and dip each candy bar in it. Transfer to a wire rack so the chocolate can set and any excess chocolate can drip off. Let the chocolate set before serving. Store covered in the fridge for up to 3 to 4 weeks. These candy bars are big and with just 4g net carbs per bar, they’re easy to fit into your meal plan. They can be used as a small meal on-the-go, or cut them in half and enjoy them as a snack.